Pink Beach, or Pantai Merah, as it is aptly named, is one of seven pink beaches on the planet, and is just one of the many amazing features of Komodo Island that make it truly a Natural Wonder of Nature. This exceptional beach gets its striking color from microscopic animals called Foraminifera, which produce a red pigment on the coral reefs. For this reason, it is called Red Beach in the local tongue. When the tiny fragments of red coral combine with the white sands, this produces the soft pink color that is visible along the shoreline. Aside from Pink Beach itself, a few small segments along Komodo’s eastern bay also have a pinkish tint. Located immediately west of Flores island in East Nusatenggara , Komodo Island is one of three larger and many islets that make up the Komodo National Park, and is particularly well-known as the natural habitat of the Komodo dragon. 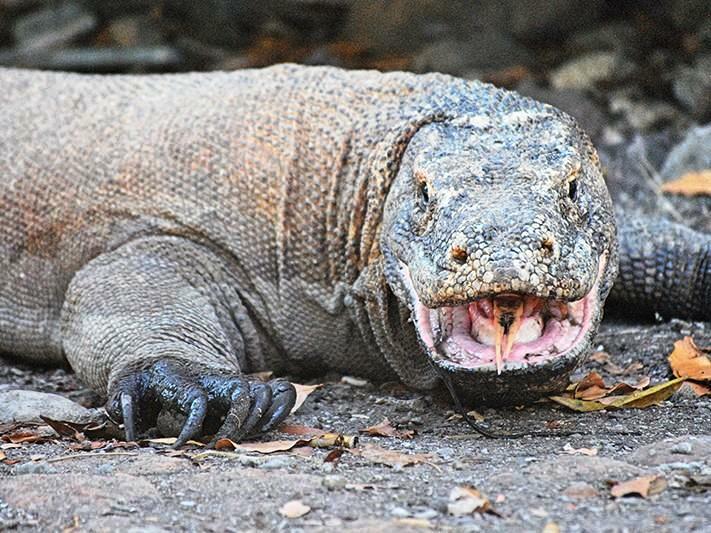 The Komodo Dragon is the largest living lizard, and takes its name after the island. Take a moment to appreciate panoramic views of turquoise seas, green rolling hills, blue skies and fascinatingly pink sands. Aside from the obvious relaxation amidst this picture perfect scenery, Komodo is not short of interesting activities to partake in. Once you have finished taking in the magnificent surroundings, take a dip in the waters and uncover the marine beauty that Pink Beach has to offer. Of course, there is much more to see the deeper you venture. Relax on the fairytale-like pink sands and work on your tan. Or join in with the various other available water sports such as kayaking or just having a leisurely swim. If photography is your passion, this is definitely a place to try your hand at capturing the stunning natural beauty of the island. And make sure you stick around till sunset, as the view is amazing. A few points to keep in mind, is that this is an uninhabited island, and it also is the natural habitat of the Komodo Dragon. If you see the creatures roaming the coast or in the water, be sure to keep a distance. Komodo Dragons are excellent swimmers and are even capable of swimming inter-island. Komodo Dragons are wild animals that could be potentially dangerous to people, so it is not recommended to visit this beach without the help of an experienced guide or ranger. From Bali, local airline has daily flights to Labuan Bajo by small jet or turbo-prop planes carrying 50 passengers. Labuan Bajo is the gateway to the Komodo islands. Once in Labuan Bajo, you can proceed to Komodo by speedboat.The port in Labuan Bajo is about a 10 minute drive from the Labuanbajo airport. You can choose to dock straight on the fabled Pink Beach, or if you prefer a trek through the coral cliffs and mangroves, you could dock on a different side of the island, and embark on the 4 hour trek by foot to the beach.